President Trump's golf date this weekend with Japanese Prime Minister Shinzo Abe at the Trump International Golf Club in Florida may have hit what government watchdog groups are calling an ethical sand trap. Abe, whose first stop in the U.S. on Thursday is Andrews Air Force Base, is also staying at the Trump-owned Mar-A-Lago resort in Palm Beach — and that is a bright red flag for John Wonderlich of the Sunlight Foundation. "The president, in going about his work, should be completely separate from his commercial interests," Wonderlich told NBC News. "The concern here is that by hosting foreign leaders at his resort he is directly receiving money from a foreign government." And if Trump is putting Abe up for free "he is then donating money to a foreign government," said Wonderlich, who is weighing whether to file a formal complaint with the Office of Government Ethics. "So there is clearly a conflict of interest." Jordan Libowitz of Citizens for Responsibility and Ethics in Washington agreed. "On the legal side, if the Japanese government is spending any money at Mar-A-Lago, the president is further violating the foreign emoluments clause of the Constitution," Libowitz, whose organization is already suing the Trump Administration for alleged ethical violations, said in a statement. White House spokesman Sean Spicer said Abe was Trump's guest. "He was be his guest at Mar-a-Lago," Spicer said. "That is a gift that the president is extending to the prime minister. "No other members of the Japanese delegation will be staying there, he added. There was no immediate response or confirmation of that from the Japanese government to a question from NBC News. Trump has also vowed to donate to the U.S. Treasury any money that foreign governments spend at his resorts or hotels. But he has yet to explain the mechanics of that. For Wonderlich, the fact that it's taken until now for Team Trump to address this question is yet another red flag. "It's pretty extraordinary that they are failing to navigate what is fairly easy to anticipate as an ethics concern," he said. "This raises the question of whether the President is making decisions on the basis of public interest or is he lining his pockets." LIbowitz said Trump hosting Abe at Mar-a-Lago "s not necessarily illegal, but still unethical." Abe is arriving in Florida on Friday around 1:45 p.m., according to a schedule released by the White House. And he’s hitting the links with Trump, as part of a foursome, on Saturday. 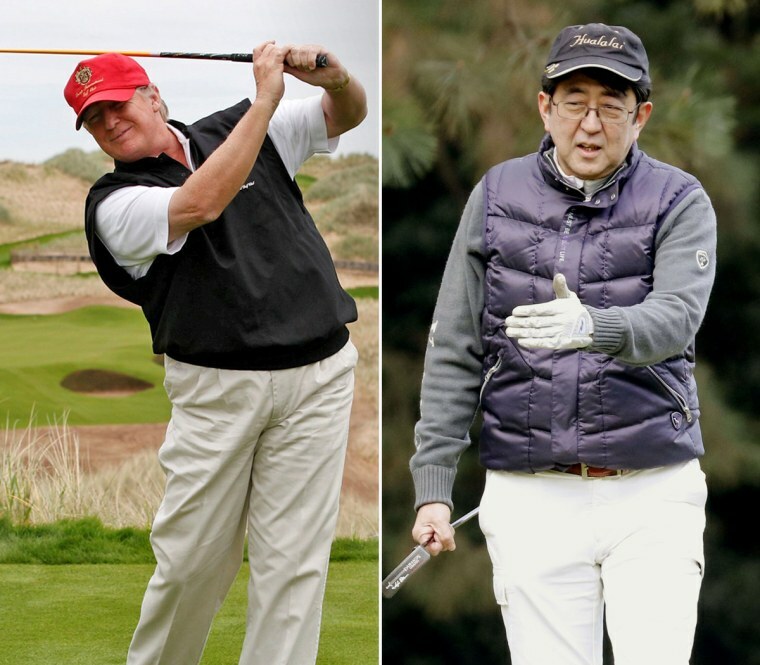 Golf diplomacy — as well as politics — runs in Abe’s family. His prime minister grandfather, Nobusuke Kishi, and President Eisenhower played a round near Washington in 1957, Reuters reported. Also, Abe appears to know Trump’s golfing sweet spot. In November, he gave Trump a Honma Beres S-05 driver that cost $3,755, according to Golf Digest, which noted that it comes with a black or gold-colored head. Abe went for the gold.